This graph uses the data set entitled FAILURE found in the SASHELP library. Each observation of the FAILURE data set contains the type of manufacturing defect and a count of how many times it occurred. 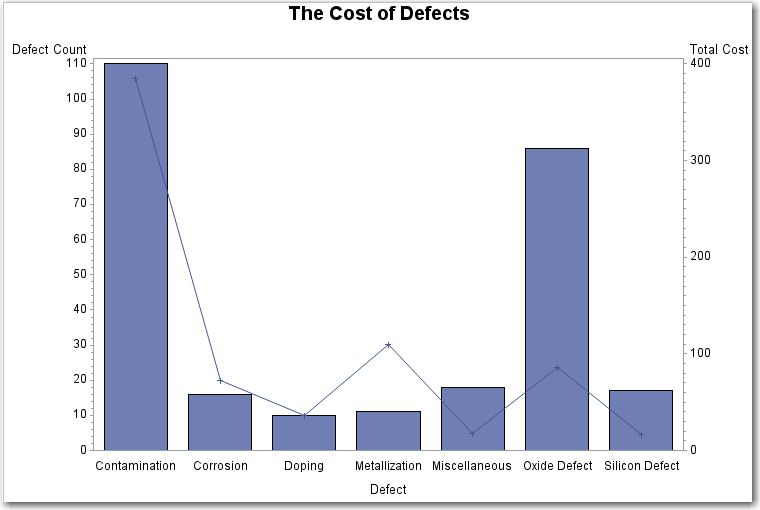 Define data that associates a cost with each defect. Assign a label of 'Defect' in place of the variable name in the data set. Define the labels for the axes. Produce the bar-line chart.The SUMVAR= option in the BAR statement specifies the variable that determines the height of the bars. The SUMVAR= option in the PLOT statement specifies the plot variable, in this case the Cause of Failure, or Defect.. GBARLINE multiplies the value of the FREQ= variable (cost assigned) by the value of the COUNT variable, and uses the result to determine the plot points.